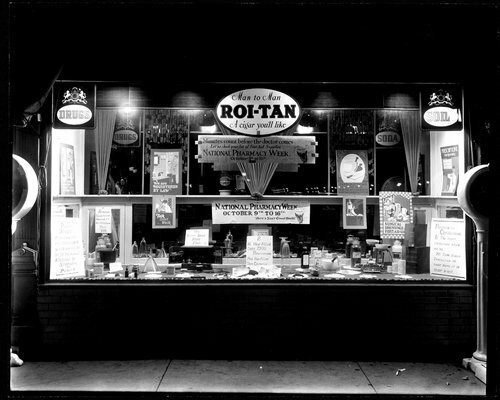 This photograph shows a display created to celebrate National Pharmacy Week. The window includes the "tools" of the pharmacy trade such as beakers and chemical bottles. One hand printed sign says "We have filled over 7500 prescriptions and have filled them correctly." Another indicates that the pharmacists is registered as required by state law. The business was located at 17 South Jefferson Avenue in Iola, Kansas.